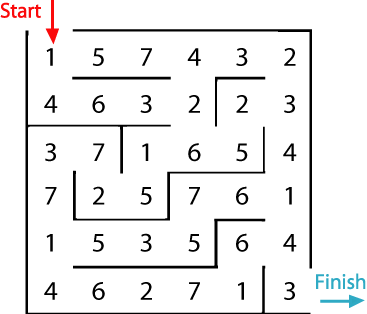 In this maze there are numbers in each of the cells. You go through adding all the numbers that you pass. You may not go through any cell more than once. Can you find a way through in which the numbers add to exactly 100? What is the lowest number you can make going through the maze? Route inspection problems. Working systematically. Combinations. Investigations. Trial and improvement. Place value. Addition & subtraction. PrimaryResilient. Generalising. Multiplication & division.